The future of our carbon dioxide and greenhouse gas emissions will decide how many degrees will planet Earth be warmer by 2100 (relative to pre-industrial temperatures). 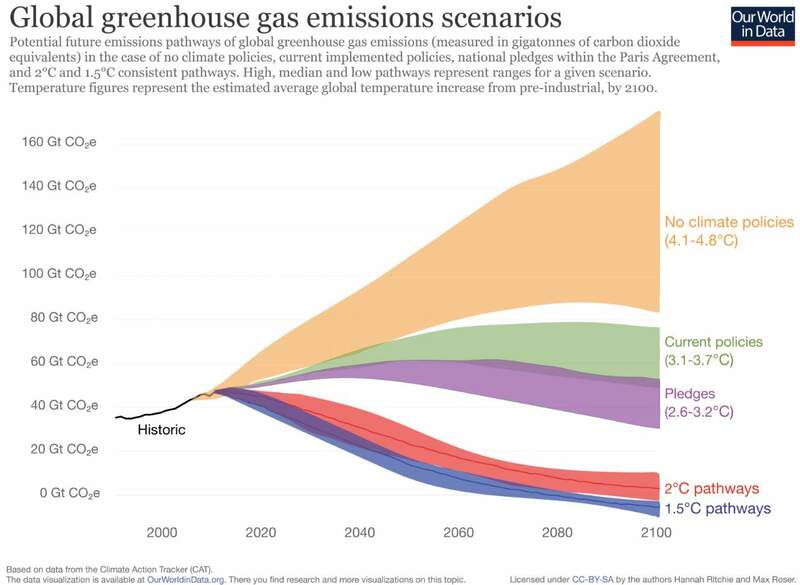 Using the data from Climate Action Tracker, the online publication that shows how living conditions are changing, Our World In Data has published a chart showing future greenhouse gas emission scenarios and how each scenario would result in an estimated global warming by 2100. No climate policies: projected future emissions if no climate policies were implemented; this would result in an estimated 4.1-4.8°C warming by 2100 (relative to pre-industrial temperatures). Current climate policies: projected warming of 3.1-3.7°C by 2100 based on currently implemented climate policies. National pledges: if all countries achieve their current targets/pledges set within the Paris climate agreement, it’s estimated average warming by 2100 will be 2.6-3.2°C. This will go well beyond the overall target of the Paris Agreement to keep warming “well below 2°C”. 2°C consistent: there are a range of emissions pathways that would be compatible with limiting average warming to 2°C by 2100. This would require a significant increase in the ambition of the current pledges within the Paris Agreement. 1.5°C consistent: there are a range of emissions pathways that would be compatible with limiting average warming to 1.5°C by 2100. However, all would require a very urgent and rapid reduction in global greenhouse gas emissions. A greenhouse gas is a gas in an atmosphere that absorbs and emits radiant energy within the thermal infrared range. This process is the fundamental cause of the greenhouse effect (the process by which radiation, from a planet’s atmosphere, warms the planet’s surface to a temperature above what it would be without its atmosphere). The primary greenhouse gases in Earth’s atmosphere are water vapor, carbon dioxide, methane, nitrous oxide, and ozone. Without greenhouse gases, the average temperature of Earth’s surface would be about −18 °C (0 °F), rather than the present average of 15 °C (59 °F).